Quarterback Carson Wentz speaks about his return Wednesday. Good morning. The Eagles will be on the practice field at 1 p.m. Players will speak to reporters after practice. Pay attention to the status of Jay Ajayi, who missed Wednesday's session with a back injury. He's considered day-to-day, but if he's not on the field for today's practice, it could be a bad sign for Sunday's game against the Indianapolis Colts. Eagles quarterback Carson Wentz will make his return to game action Sunday. This is Week 3 for the Eagles, but it will be Carson Wentz's 2018 debut — and a long time coming. How will he temper his excitement? 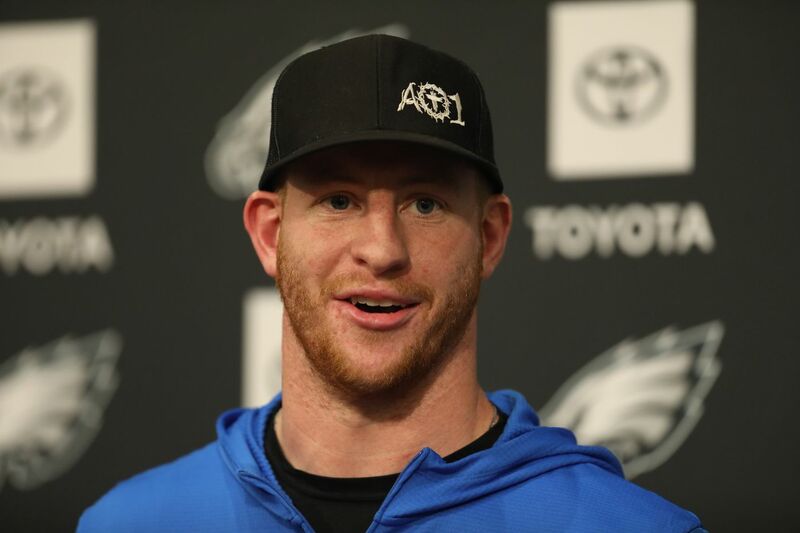 "The same way I temper excitement going back to my first start in college junior year, my first start in the league against Cleveland a couple years ago," Wentz said. "It's the same kind of approach. I'm going to have a lot of excitement, but once we get playing, it's just going to be football again." In Wentz's NFL debut, he finished 22 for 37 for 278 yards, two touchdowns, and no interceptions. In his first college start, Wentz went 16 for 28 for 198 yards and two touchdowns, along with 86 rushing yards and two touchdowns. Wentz had nine grueling months of rehab in trying to return for Week 1. He knows the anticipation for his return. He knows what the crowd will be like Sunday — he also knows what his emotions will be like — but he thinks once the game starts, it'll be just football. The first hit will probably reinforce that opinion. Doug Pederson said he hopes it's not a hard hit, but that hit could help give a returning player confidence that he's back. "No matter injury or not, the first hit of the season is always a good wake-up call," Wentz said. "It's a good wake-up call to remind yourself it's a man's game out there." The Eagles practiced Wednesday for the first time this season knowing Wentz will start their next game. Although Wentz has been practicing throughout the spring and summer, there's a different feeling in the NovaCare Complex now that the No. 1 quarterback is back. "It's been positive," Pederson said. "The guys have been very receptive. They've been very complementary of Nick [Foles] as well. That's good to see. We're blessed to have two special quarterbacks. Obviously now with Carson coming back, they're excited to — as they say, the band is slowly coming together. This is one piece of it." Left tackle Lane Johnson told reporters that Wentz's high-energy personality and the effort Wentz put into returning have a positive effect on teammates. Wentz's return has made this a type of week different from what it typically is after a loss. The players are not viewing Wentz's return as a cure-all, but part of the luxury of having a player such as Wentz is how his presence affects the rest of the locker room. "New energy coming," Johnson said. "We've got to pick our stuff up. I don't want to put all the pressure on Carson." The Eagles placed Mike Wallace on injured reserve Wednesday to make room for Jordan Matthews, but they're still maintaining hope that Wallace will return this season. Mack Hollins and Richard Rodgers are also on injured reserve, though, and the Eagles will likely have more injuries this season. Teams are allowed to bring only two players back from injured reserve during a season. (Tim Jernigan, who is on the non-football injury list, and Chris Maragos, who is on the physically-unable-to-perform list, don't count.) So one of Wallace, Hollins, and Rodgers definitely will not return, and the Eagles will have a tough decision to make later this year. Pederson indicated the Eagles will figure this out later in the year, but it's certainly something to watch. Quarterbacks Carson Wentz and Nick Foles (left) during practice Wednesday. Carson Wentz is back, but it's two weeks later than he hoped, Paul Domowitch writes. The Eagles signed Jordan Matthews. It was a wish come true for Matthews and Wentz to play together, Les Bowen writes. Jeff McLane breaks down the film to show the differences between Wentz and Nick Foles. With injuries at running back, Josh Adams could play a role Sunday. Domo offers his Eagles-Colts scouting report. Love Peters and his production when in is amazing. But is it time to stop relying on him given he gets hurt so often? However, Jason Peters is too good — and has built too much equity in the organization — for them to stop relying on him. When he's in the game, he's a difference maker. And Halapoulivaati Vaitai started in the Super Bowl, so he's been a trustworthy reserve in case Peters needs to leave for a few snaps. If Peters misses a few snaps here and there, it's not a big deal. The problem comes when he exits with injuries early in games. However, the Eagles are soon going to have to determine what the long-term outlook of the position will be, whether it's Vaitai, Jordan Mailata, or a tackle to be determined.